Travel Instructions: Land access to the lighthouse has been restricted for several years. The former Salmon Point Campground has been sold, and a fence and posted signage restrict access to the site. You should now plan on viewing the light from the water or air. You can get near the former gate to the campground by following these directions, but there is no view of the lighthouse: From Main Street (Highway 33) on the western end of Picton turn south on Lake Street (County Road 10) and drive for 8.5 km (5.3 miles) to Cherry Valley. At the stop light, continue straight onto Country Road 18. After 7 km (4.4 miles), turn left onto Salmon Point Road and continue to the campground at its end. The lighthouse is privately owned. Grounds/lighthouse closed. Description: Near the eastern end of Lake Ontario, Prince Edward County Peninsula juts out from the northern shore and presents a major obstacle to mariners. Lighthouses were built on False Duck Island in 1828, Point Petre in 1833, and Scotch Bonnet Island in 1856 to mark, respectively, the eastern, southern, and western extremes of the peninsula, but mariners still feared a point just west of Point Petre, giving it the name Wicked Point in addition to its more common name of Salmon Point. A dangerous reef that extends offshore from Salmon Point for three kilometres snagged several vessels including the schooner Jessie, which was driven onto the reef by a change of wind on the night of October 30, 1870. Inhabitants of the area gathered on the beach the following morning hoping to render aid to the crew, but all most could do was helplessly watch as rollers swept across the schooner’s deck while five people clung to the main boom and three others sought refuge in the riggings. Would-be rescuers attempted to launch a boat into the breakers, but it was repeatedly swept back upon the beach. About 10 a.m., the vessel broke apart and sent the crew to a watery grave. 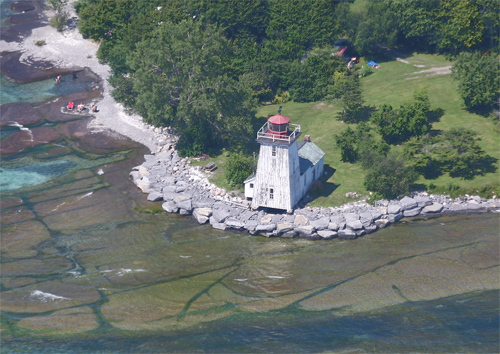 A substantial new lighthouse, with keeper’s dwelling combined, was recently erected at Salmon Point, in the County of Prince Edward, on Lake Ontario, as wrecks have occasionally occurred there, some of which were attended with loss of life. It is a square wooden tower, and the light is a powerful red one on the catoptric principle, and has been seen a distance of upwards of fourteen miles. There are two No.1 circular burner lamps with 20-inch reflectors, and three mammoth burner flat-wick lamps with 18-inch reflectors, and the light was lit for the first time on the 23rd of October, 1871. Mr. Lewis Hudgins was appointed keeper, at a salary of $300 per annum, which includes remuneration for his services in connection with the lifeboat stationed there under his charge. The total cost of construction of this lighthouse, keeper’s dwelling and equipment was $1,913.71. R. Cameron was paid $1,617 under contract for building the lighthouse, while E. Chanteloup received $287.84 for the lighting apparatus. I beg to state that I did vote against Mr. Walter Ross, at the elections in 1874; but, as to using an violent or profane language concerning the present Government, I deny altogether, and I furnish you with a statement, signed by supporters of Mr. Ross and all my immediate neighbours, and who would have heard me if I had been guilty of any of the charges with which I am accused. Party feeling runs very high in this county, and this is done simply to injure a political opponent. Trusting my explanation will be satisfactory. There are three mammoth flat-wick lamps on cast-iron stands, and two circular-burner lamps of the same kind, and five 20-inch reflectors. The glass in the lantern, which is 30 x 36 inches, is white, but the light is rendered red by five panes of ruby glass 21 inches square, suspended in front of the reflectors. The lantern is made of wood and has a wooden floor, and is consequently exposed to take fire. It should be covered with iron or zinc. The tower is 29 feet high, from the ground, while the light is about five feet higher. We delivered the supplies to Mr. Louis Hudgins, the late keeper, and after doing so, Mr. Peter Huff made his appearance with his official appointment, when Mr. Hudgins arranged with him to handover the lighthouse property to him on the day following our visit. Keeper Hudgins served until 1897, and his total time as keeper spanned twenty-three years, over half the time Salmon Point Lighthouse was staffed. In 1885, a breakwater was built at the station to protect the lighthouse from the rising waters of Lake Ontario that threatened to undermine its foundation. Amos McDonald replaced Hudgins as keeper in 1897, and his twelve years at Salmon Point was the second-longest term. On the morning of December 11, 1902, the wooden steamer John Hall, with the schooner barge John R. Noyes in tow, left Charlotte, New York bound for Deserento, Ontario with a cargo of roughly a thousand tons of coal. The vessels were owned by the Donovan family. Captain Tim Donovan was in charge of the Hall, assisted by his son Jerome, while George, another son, was in command of the Noyes. Strong east winds, fog, and snow combined to slow the steamer’s progress, and the two vessels sought shelter off Salmon Point in the lee of Prince Edward County. When the fog lifted, Captain Donovan decided to make a run for the protected waters of the Bay of Quinte, but he never made it. At some point on the 13th, the little steamer became overwhelmed, and George Donovan gave the order to cut his schooner free to give his father and brother a better chance of survival. On December 16, Keeper McDonald noticed a vessel on the reef, about a half-mile from shore, and sent word to have the lifesavers from Wellington sent to the scene. There was hope the vessel was the steamer Hall, but its identity was learned a few hours later, when the battered vessel broke up, and its stern, with the identification “John R. Noyes, Oswego,” washed up on shore. After helplessly drifting for nearly two days after being cut loose from the Hall, the Noyes approached the south shore of Lake Ontario near Lakeside, where it was spotted by a farmer who walked five miles to have the news sent to the lifesaving station in Charlotte. Captain Gray and his crew promptly chartered a special train to take them and their lifeboat to Lakeside, from where they launched their boat and rowed twenty miles to chase down the Noyes on the 15th. After the five helpless crewmembers and their two dogs were rescued from the Noyes, the vessel was abandoned as there was no way the lifesaving crew could tow it to shore. Over the next several hours, the Noyes drifted north before running aground at Salmon Point. Wreckage from the Hall was found a few days later on Main Duck Island, confirming everyone’s fear that the vessel had foundered shortly after parting with the Noyes. 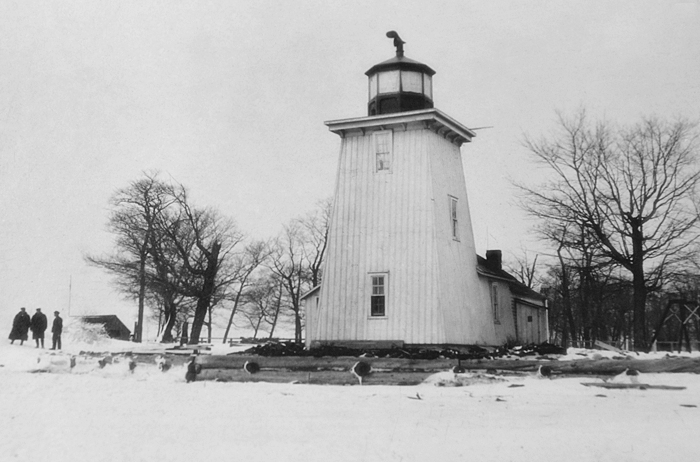 A fourth-order, 360° French lens replaced the array of lamps and reflectors in the lantern room in 1909, and on July 1, 1913, Salmon Point Lighthouse was discontinued. In 1920, Salmon Point Lighthouse and the associated property were sold for $100 to George Cummings, who used the property as a summer cottage. 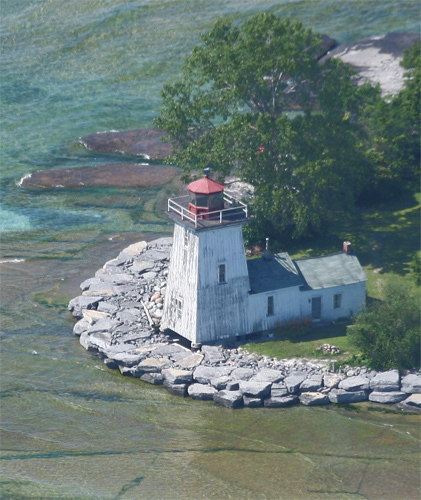 The Ranklin family later purchased the lighthouse, and for many years it was available as a rental property as part of Salmon Point Campground. The campground was formerly open to the public, but a gate now limits access to campers who have a long-term lease on the point. Keepers: Lewis Hudgins (1871 – 1876), Peter Huff (1876 – 1879), Lewis Hudgins (1879 – 1897), Amos McDonald (1897 – 1909), Anson Shortt (1909 – 1911), James Cavanagh (1911 – 1912), Alex Clark (1912 – 1913). “Nothing from Steamer Hall,” Daily Palladium, Oswego, New York, December 16, 1902. Debates of the House of Commons, 1879.